"I like the CIA Program's flexible service contracts, reports at a fingertip and accurate record keeping. The program is very easy to use and understand. Computer Mike solved all my problems." "The CIA Program is excellent. It has helped me in the office to keep track of all my customers in a much faster and easier way. It is very organized and simple to understand. It is very easy to use. It helps very much on keeping good records on my outstanding balances." In the 10 years that I've been using the CIA Program, I have seen it evolve into such a useful program and I always look forward to the new version releases to see what's new. I would never think twice about recommending this product to anyone." D & J Lawn Sprinkler Systems, Inc.
"I like the ability to manage all my customer records from one single screen. As well, I like the versatility it provides me with printing my daily work orders and keep track of my receivables. I also find very helpful the "Current Resident" key. During the last winterization season I was able to recover about 10 to 15 customers that I had otherwise lost because I was able to get the current resident name and phone number thru CIA and was able to speak to the current homeowner and get their business. Mike is always there to provide me with tech support, including weekends and at night. Also, I like how he customized several features for my business." "I can't imagine our business without the CIA Program. This program makes managing and accessing customer data so simple. With the click of a mouse, this database holds all the information you could possibly need about a customer's irrigation system as well as work orders, invoicing, scheduling and ledger activity. Computer Mike responds to customer service issues almost as quickly as a click of a mouse. His desire to satisfy his customers makes the CIA Program invaluable!" "We are very pleased with the CIA Program. All the features work well for our needs. One feature that has been especially helpful is the tracking of customers. We are able to tell which systems still need to be winterized and which RPZ's need to be tested. In addition, Mike is extremely helpful. If he is unavailable when you call, he is always prompt with returning your message and will do all he can to help you with whatever you may need. He'll even go so far as to call back a few days later and follow up on your question. He is always open for suggestions and improvements as well. He works to make the program most beneficial to your company's needs." "Makes my job much easier. A very good program that keeps me closer to my customers." "I really like the program's ease of use. Also a simple to teach program for new office employees. Mike has made my work in this business easier every time I talk to him, also Mike is extremely prompt in addressing any issues I've ever had." "I think the CIA Program is the best piece of equipment I ever bought for our business in 22 years. It keeps up highly organized and competitive. We can't begin to think back on how we ran this business before. Accounting is far more precise. Customer activity is easily tracked. It frees up time for me – I work 1 to 2 hours less in the office every day." "This program is very streamlined and effective in accessing client files, scheduling work orders and mapping routes for servicemen. It has allowed us to complete our winterization schedule very simply and systematically creating a stress-free fall for us all! Mike is an extremely knowledgeable and competent "computer guy." From our purchase of the CIA Program 10 years ago up to today he has always been very responsive and timely in helping us through our questions or concerns. In addition, he is very attentive to the wishes of his clients and has made improvements to the program regularly reflecting his clients' wishes. We appreciate the fact that we are able to discuss and solve our dilemmas with a small, personalized company, not a big, impersonal, uncaring firm." "The CIA Program is by far the best investment I've made for our company. Computer Mike has done an excellent job! Computer Mike and CIA Program Priceless! This program is a work of art. Thank you, Mike!" "The CIA Program is extremely well thought out. It covers virtually every aspect of the irrigation business' daily operations, and is easy to learn. Unexpected benefits include its speed and efficiency as well as a number of reports now available for our use in analyzing the business from many aspects. Computer Mike offers continual updates and a super support system. He's extremely patient, thorough and available. We've tried other software programs but they don't compare to CIA. It certainly makes my job a lot easier!" "It's been said that if a man works only with his hands he's a laborer; if he works with his hands and his brain he's a craftsman; and if he works with his hands, his brain and his heart then he's an artist. Computer Mike is most definitely an artist. None of us at Maxwell Irrigation claims to be a whiz on the computer so when we run into problems or glitches that we deem beyond our capabilities we call on Mike. It never ceases to amaze us that this busy, so much in demand computer genius actually takes the time to walk and talk us through the solution to each and every problem. His patience is legendary in this industry. Nary a cross word nor a sigh of exasperation is ever heard from this gentle teacher – instead, he shows us shortcuts and lets us in on little tips to get the most out of the CIA Program. Mike is one of only a handful of people who can be the consummate professional and still be loads of fun. The best part of the program for me is the fact that it's so geared to our industry. I can even access info on one customer while producing an Invoice for another – this is an invaluable feature and one that keeps me from mumbling under my breath when the boss needs an address or phone number while I'm in the middle of doing an Invoice. We also really appreciate the mapping capability because as our company grows so does the need for qualified technicians and often they must be recruited from out of the area. The maps are so easy to follow and so precise that any technician unfamiliar with our service area can find a customer's house in a jiffy. We used to think our old way of keeping track of company business was pretty good – now we look back and realize how barbaric it was compared to the CIA Program. We are grateful for Mike's expertise, his friendship and the free updates and improvements always coming our way." 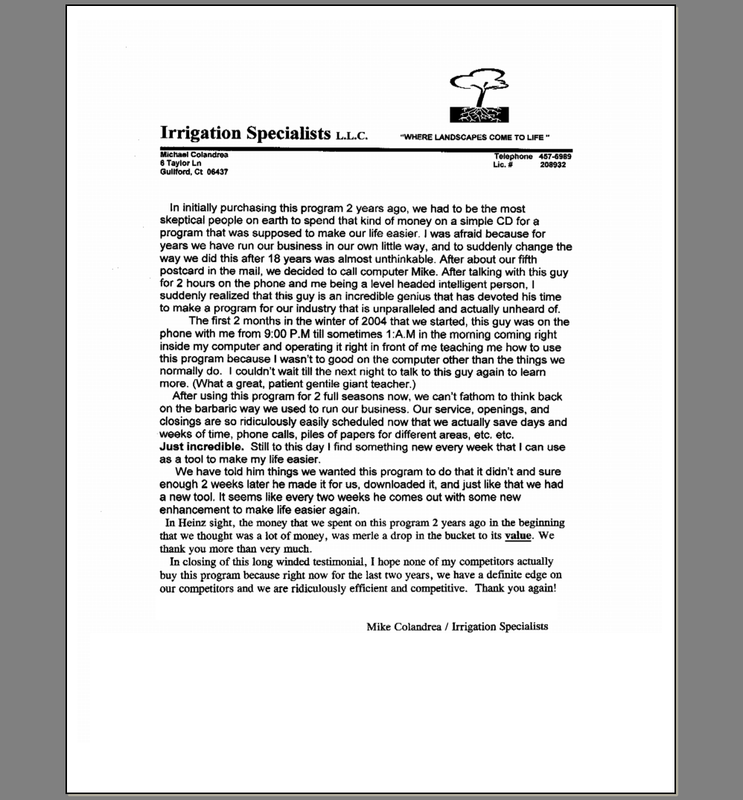 "We would recommend this program to anyone in lawn irrigation. Simplified our scheduling and billing. Better use of time. Brought our service into the 21st century. It's made my business more profitable." "The only thing becoming scarce in a world of abundance is human attention. You give us prompt, helpful and courteous human attention, and for that we love you. The CIA Program is incredible. Before we got it we didn't realize how much time we were wasting and how much money we were losing by doing things the old way. We thought it was a lot of money at first, but to our delight, just like you said, it more than paid for itself in the first year alone. It's made my job so much easier! Thank you, thank you, thank you! P.S. We would prefer that our competition not know about this program because of the competitive advantages it gives us over them." "What I like best is that the program is designed for irrigation companies so it has everything we possibly need and more – mapping, reports, easy invoicing, work orders and detailed customer information. Excellent program; great support – Computer Mike is always available 24/7 – weekends, evenings … whenever." "Fabulous! Makes operations run smoother. Mike has been very helpful in the setup and training process. We enjoy the program very much." "Easy setup, user-friendly, outstanding user support. The program is very dependable. Mike is very on top of the irrigation and landscaping business owners' needs. If there is anything you need to make your business run easier he will find a way to help you. Thank you very much for always being there for us." "The CIA Program is the best! Anybody who keeps track of customers should have this product. But you have to try it to really appreciate the value. It stores so much info – even pictures – and instantly retrieves it. Try it and you will buy it. As for Mike, the service is top-notch. He is always there. Both the program and Mike are a class act. Excellent support." "I really like the availability to get customer details along with irrigation details and backflow details and now that CIA has included GPS -- this program is awesome! Mike is always available for support and questions, so never have to worry about problems!" "My business has doubled thanks in large part to this powerful program. I am now in a position to grow further as well. Mike's genuine care for the success of all companies that use his program is greatly appreciated. The only thing the CIA Program doesn't do is the actual sprinkler service itself! An unexpected benefit I'm getting by using this program: My accountant loves me!" "A fantastic program backed by a service unparalleled by any other company. Your ability to seek what a company's requirements are and fulfill them completely is the most compelling reason for any business owner to obtain your services. Keep up the good work!" Water Wheel Sprinkler Systems, Inc.
"The things I like best about CIA include the easy scheduling features, revenue & receivables tracking. Unexpected benefits I got by using this program are the enormous amount of features strictly for irrigation companies. The support is amazing. Mike has made himself available every day of the week at all hours of the day. I've searched 5 years for a program tailored to my needs, and I found everything I was looking for and more in CIA. My business is much more efficient now and therefore much more profitable."